Posh substitute Junior Morias can't believe he's missed a last-minute chance of a winning goal at Chesterfield. Photo: Joe Dent/theposh.com. Ah well at least the entertainers were back, even if this was strictly amateur dramatics rather than Broadway standard. Students of form could never have predicted a six-goal thriller. 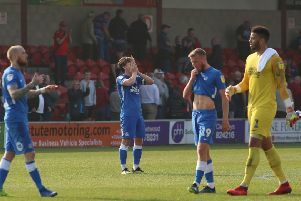 After all the Posh forward line has seen more poor reviews than a Ricky Gervias film and relegation-bound Chesterfield hadn’t scored more than a goal in a game since they last played Grant McCann’s side in December. Top scorer Tom Nichols scores for Posh at Chesterfield. Photo: Joe Dent/theposh.com. Posh won 5-2 that afternoon and should have posted a similar result at the Proact Stadium last night, after a dominant display which included four strikes against the woodwork and a late ‘goal’ disallowed for offside, a decision that had McCann spitting feathers after the game, and not just because it denied Craig Mackail-Smith the hat-trick his all-action performance deserved. Any lingering hopes of a late surge for the play-offs have surely now evaporated. Posh won’t find more accommodating opposition for the rest of the season. Certainly not defensively with Chesterfield manager Gary Caldwell - a decent centre-back himself - describing his side’s back-four work as ‘suicidal’. Posh did score three times, but defended with such a casual air they also conceded three. The home forwards were granted too much space and time when lining up shots and took advantage, even if the final equaliser passed Luke McGee in the Posh goal via a deflection, a fact which gave credence to McCann’s post-match belief that Lady Luck is due to visit his side again soon. Of course good fortune shouldn’t be required to beat a side as poor as Chesterfield. This result left them 10 points from safety and a great escape is as likely as Posh threatening the top six any time soon. Posh star Paul Taylor skips past a Chesterfield defender. Photo: Joe Dent/theposh.com. There were positives, most noticably in the hard-running display of Mackail-Smith, an Energizer bunny in human form, who played with the freedom of a man released from an agonising near six-year wait for that 100th Posh goal. Posh fell behind to a Sylvan Ebanks-Blake strike in the fifth minute, but within two minutes Mackail-Smith was given the time to apply chest control to a fine Tom Nichols cross before volleying home from close range. Mackail-Smith’s second goal put Posh 3-2 ahead on the half hour mark after he was slipped through by Brad Inman and a 20th two-goal game in Posh colours almost became something even better as he struck the crossbar following a fine second-half move involving Paul Taylor and substitute Junior Morias before he stooped to head home from inside the six yard box after Jack Baldwin had volleyed Inman’s cross back across goal 10 minutes from time. An offside flag ruined that terrific match-winning moment. Nichols had shot Posh 2-1 ahead - his fourth goal for Posh against this opposition - after accepting a pass from the excellent Taylor on 18 minutes before more dismal defending from a home free kick enabled Kristian Dennis to smash home Chesterfield’s first equaliser on 28 minutes. Posh man of the match Craig Mackail-Smith has just struck the crossbar at Chesterfield. Photo: Joe Dent/theposh.com. Only one goal arrived after the break when Dion Donohue’s shot nestled into the net after a kind ricochet off a Posh defender, but the lack of a tackle or any significant marking was just as big a contributory factor. Chesterfield enjoyed a period of dominance in the first 20 minutes after the break, but Posh battered them in the final 20 minutes without managing to find a winning goal. Jack Baldwin sent a header onto the top of the crossbar from a Taylor free kick, Morias miscontrolled after Taylor had set him free and then it got even worse for the former St Albans striker. With two minutes left Michael Smith’s shot at goal fell kindly for Morias, two yards from goal with just a defender to beat on the line, but he snatched at a left-foot shot and watched in horror as the ball struck the outside of a post and bobbled behind. It was that kind of night, one that often visits teams in no sort of form. Captain Chris Forrester did threaten a very welcome return to form. His highlights reel included a first-half blast from 25 yards that rattled the crossbar. Chesterfield: Thorsten Stuckmann, Dan Jones, Sam Hird, Dion Donohoe, Tom Anderson, Connor Dimaio, Kristian Dennis, Rai Simons (sub David Faupala, 70 mins), Osman Kakay, Jon Nolan (sub Ryan Gardner, 75 mins), Sylvan Ebanks-Blake. Unused substitutes: Ryan Fulton, Angel Martinez, Reece Mitchell, Liam Grimshaw, Joe Rowley.